As we transitioned from the eastern end of the island towards the west, Map Man finally found us a rare river valley on Crete in which to enjoy more moderate grades. It was heavenly to spin the pedals with less effort and watch the numbers on our odometers tick by at a visible rate. After more than a week of primarily using the lowest 3 speeds of the 27 available to us, we were relearning how to shift through all those other gears. Previously, we were either slogging up 5-15% grades or braking down equally steep and rough roads--there was no pedaling to be done on these down hills and there wasn’t much that was level between the ups and downs. But amazingly, even though we started the day in the mountains, rode part of the day along a river valley and finished a bit above sea level, we still accumulated over 2000’ gain! That’s Crete. The rustling and bustling of “Rooms to Let” owners airing out their rooms and shopkeepers restocking shelves signals that the tourist season is about to begin in earnest on Crete. Orthodox Christian Easter, which is 4/27 this year, is the traditional ‘opening bell’ for the season, though the unusually cool, wet weather and struggling global economy puts the influx of tourists themselves into question. But we can tell that there are more tourists out and about each week that we are here, mostly zipping by in their new, ultra-compact rental cars with only a rare tour bus on the road so far. It’s been surprising to spot over a dozen cyclotourists on Crete, especially since we can go months without a single sighting except in Germany and Austria in the summer months: Crete must be quite a cycling destination once the season gets under way. We encountered our first-ever French cyclotourists here on Crete and have met a total of 6 so far. In fact, we have seen more French tourists traveling by any mode on Crete than any other area outside of France. And we have been pleasantly surprised that the French aren’t so reticent to speak English when away from France. They still are a bit more aloof than other tourists and we were amused that a group of 2 and a group of 4 French cyclotourists passed each other on the road without figuring out that the other group was French even though we had managed to talk to both groups (those pushy Americans). We were towered over by 6,000’ snowcapped mountains as we rode west between the northern coastal towns of Georgioupoli and Hania.. Whether at sea level or riding up into the foothill gorges we were rarely out of sight of these mountains. 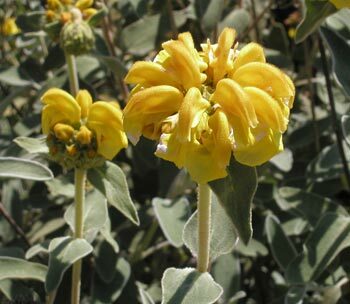 For what seemed like hours as we climbed to the 1000’ level we were surrounded by tall shrubs in bloom: Scotch broom, vigorous lavender-blossomed sage, and the new-to-us Jerusalem sage with its dozen or more pea blossom-shaped yellow blooms clustered like an umbrella. Up, down and all around us there were blooming plants—it was like riding through a field of flowers. And the understandably ecstatic bees buzzed around the slopes blanketed by blooms and their clustered wooden boxes from which the human owners periodically snitch honey. Down the other side of the hills the flowers were more subdued. The purples were running a distance second to the yellow blossoms in prevalence: with tall, purple-flowered thistles; viney vetch with its deep purple blooms and the purple-blue lupines in occasional clumps. Orange tree blossoms were by far the most fragrant flowers though there was a pleasant, blended scent of wild blooms always in the air. I tried over and over to fill my head with those yummy orange blossom smells as I know I will miss their pungent sweetness when we are riding in the more northern countries in another month. The olive trees in this more western part of Crete don’t appear to have been have been pruned for years (unlike eastern Crete). We are stunned to see that the fine-meshed green nets used to collect fallen olives that are neatly stored in eastern Crete were already spread on ground in western Crete. These nets were put out so long ago that they are no longer effectively covering collection area and have small plants growing up within the fabric grid. The olive trees don’t look as pampered or as prized here-perhaps the orange tree is king. Being seduced by the availability of bike-friendly roads on Crete, Map Man wasn’t going to let us leave the island before we had ridden most of those roads. But a brief route-planning-committee-meeting reeled him back in—we don’t have to ride ALL of the suitable roads in a given locale. After all, we have no performance standard to meet, no contract to fulfill, no one to account to about anything. But struggling as he does in some regions to find any safe and enjoyable roads for us to ride makes it hard to leave good ones untraveled here. 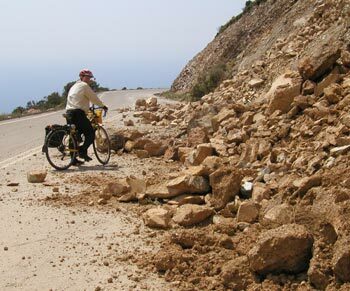 Crete has been great, though challenging riding. Most of our pedaling time has been spent on roads so small and lightly traveled that they don’t have center lines. The windy, hilly roads make for dramatic views and great panoramas. And the optimistic road building strategy of just cutting through a hillside without building retaining walls provides ample geological cross-sections to scrutinize on these inherently temporary roadways. Accommodations and food are readily available, whether you like to “self cater” as a guide book describes our eating style or drop-in at the ever-available Taverna’s. The guide books and a number of other traveler’s booking agents say that April is a fine month to visit Crete but we will wait until May should we come again. The weather should have been nice by now but waiting ‘til May would give more time for the lingering winter weather to really be gone and there is one “must see” sight that doesn’t open until May—the Samari gorge. It is spectacular though difficult to see because of the rugged terrain and its remoteness: it requires both bus and boat services to be operating to walk the 11 miles. But the snow is still in the mountains and the high river water in the gorge will delay the gorge opening for some unknown number of days or weeks this year. We reluctantly decided not to linger for the unpredictable opening day. High season on Crete isn’t until July and August—the very hottest months. High season is dictated by the traditional vacation weeks of the northern Europeans and not determined by the best time to be in Crete, which is actually when it’s not so hot. Should you want to visit Crete other than by bike, the tiny but spiffy-new rental cars seem to be a great way for getting around and coming before or after high season would be the most comfortable. We had barely decided we could leave Crete despite not having ridden all the available routes and then found ourselves saying “It’s time to leave” when we got to our next town, Hania. The traffic into Hania was brutish: fast and pushy without any finesse. The tourists in their easy to spot rental cars were courteous but the locales seemed to enjoy being impatient and rude to everyone when they were behind the wheel. And the several “Yankee Go Home” banners hardly made us feel welcome. Then there was the petty but annoying overcharging at the internet shop and the fruit stands that I am sure had nothing to do with us being Americans but just being tourists. And the less-than-helpful shop and museum staff seemed to almost be playing a shell game with their small museums, resulting in us giving up after only seeing 2 of the 4 in town. A couple of grocery clerks taught me that, unlike elsewhere on the island, I was going to have to become aggressive to not be bypassed in line. And a few days later on the road out of town our right ears had not yet had their hours of recovery time needed after having a very loud firecracker tossed our way, when a driver on a back road unnecessarily thoroughly blasted our left ears with his horn. Yes, we were sorry we weren’t rolling onto the ferry that afternoon. We always try to remember that a series of trivial, unfriendly incidents like these could just be an unfortunate coincidence and that we might pass through Hania a second time and experience none of it. Like during our first touring season, the day or 2 before arriving in Paris we had a series of less than welcoming experiences with bystanders and motorists that led us to conclude that the greater-Paris folks were into being as rude as Parisian’s were reputed to be. But when we left the Paris region on a parallel, equally small and nearby roads we had none of the unpleasantness. We know that would likely be the case with Hania but also don’t easily set aside our experience. Fortunately, Map Man had one last ride into the hills of Crete planned before boarding the dawn ferry for the 7 hour trip back to Peloponnese, essentially the Greek mainland. Our day ride was classic Crete, an overview of all the best we had seen. And graciously, the warming sun was out for much of the jaunt making for grander views from the 1700’ high cliffs down to the coast line. Our 40 mile day ride accumulated almost 3700’ in elevation gain as we once again traversed roads that clung to the crumpled sides of endless gorges and hills. We’d switchback up the side of one gorge, make the characteristic slight descent into an almost flat hairpin turn that would then initiate our traverse up the next hill. Over and over we were passed from one adjoining hill to the next, zigzagging our way up the gorges and around the peninsula. 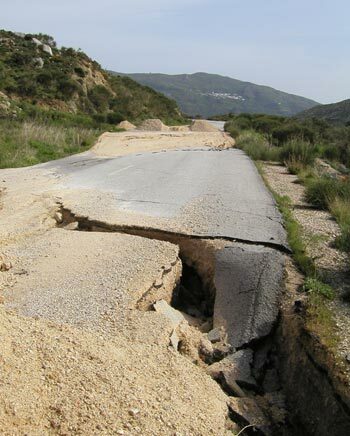 These Greek roads are temporary at best. The road builders appear to just cut the road and slap down asphalt, with no drainage or reinforcement above or below the roadbed. Landslides onto the road surfaces are endless and on just this outing there were several dozen sections were the bulldozer had just recently cleared the road of rock and dirt and a couple of new slides were waiting for clean-up. The upper banks are so fragile looking that we wondered how many landslides are triggered by the fearless foot steps of a grazing goat. Great clunks of roadway calve-off like icebergs from glaciers and tumble down the slopes. New sink holes will hazardously be marked with a few rocks piled in the center and the edge of vanished roadbed will be ringed with handy rocks, both serving as potent reminders as to why we are careful not to ride at night. We stopped in one particularly stunning gorge to admire the views and then to examine several massive slabs of vertically fractured rock just above us that were poised to come crashing down with the slightest provocation. I sure hoped the next bulldozer driver would take a long look up the before he clears the stabilizing base of the tenuous rock face on this especially narrow stretch of road. Like at this spot, there were several sections of road on our loop that made travel during rain storms look like flirtations with death. But this was a dry day and the rain showers held off until we were in for the night after completing a stunning day ride into the hills. But as always, we continued to enjoy one of the benefits of the seemingly reckless approach to road building and that’s the ‘reach out and touch it’ geology lessons. The Dolomites of the southern Alps provided dramatic panoramas on a gigantic scale of the tilting, folding and eroding of plate tectonics but Crete’s tilting and folding is on a human scale and touchably close--its right there. 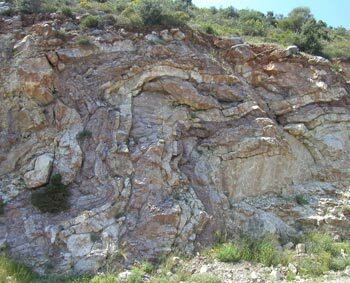 Sometimes the dramatic serpentine folding of the rock layers that occurred when it was all under high pressure deep in the earth occurs over the span of just a few inches or a few feet. We stopped countless times to peer, poke, and ponder the very visible geology. Here we can contemplate and trace at arms length geologic layers that bend back on themselves. Like someone admiring art in a gallery we alternately put our noses up close for inspection of details and stared from across the road for the bigger picture. We can handle the rocks to see if they feel as soft or oily as they look. And in some spans of exposed rock the fault lines and slippage were visible every couple of feet and we had fun tracing the rising and falling layers. Oh, where was that geologist we wish we could pull out of a pannier to answer our endless stream of questions (along with the bird expert, the wildflower expert and the historian). And then there are those interesting sections of rock that require closer scrutiny to be sure that they aren’t the old buried trees that they appear to be, seemly twisted and torn along their grain lines. Apparently Crete’s especially chaotic looking strata’s are in part due to plate tectonics occurring in 3 different directions instead of the usual 1 primary direction (2 of these movement patterns were at 90 degrees to each other.) Crete is caught in the middle between the African and European plates and gets banged on by the Anatolian microplate. And I’ve read that the angles from which these plates thrust hasn’t been constant in geologic time, literally adding a twist to the whole dynamic. Trying to understand what we are seeing in the rocks makes me feel like a freshman having bumbled into a graduate course in plate tectonics. But if one if you want a condensed, wowy look at geology you can do no better than coming to these southern Greece islands. The tilting, folding and erosion of Crete’s primarily limestone geology combined with a visit to Santorini for equally dramatic and exposed volcanic layering has made for a dramatic geological encounter. If only we had had a roadside geology book of the region to help us understand more. Along with stunning panoramas and dramatic slices of geologic history, our farewell to Crete ride was also a sampler of the green landscapes we’d seen on Crete. Some slopes and rare flat land were intensely cultivated with olive trees, orchards and green houses. The sweet, pungent scent of the occasional orange tree reminded us of previous stretches of road thick with orange groves. And the wildflowers were still out in force: there were patches of brilliant purple-blue lupines running a close second to the rarer but always showy poppies. Yellow blooms continued to be the dominate flower color with vigorous Scotch brooms covering half the surface of many of the rugged, uncultivated slopes. Then there were the typical crumbling and sometimes abandoned hillside houses, the weathered men riding their sidesaddle on their donkeys, the broad and compacted old women dressed in all black, and the sprinkling of tiny Orthodox shrines and chapels that completed the Crete sampler. And a burning question about lambs unexpectedly got answered on this ride. A few days prior we had seen a young lamb and wondered just how old he was, whether his age was measured in weeks or days. On this day we saw a young lamb with the same distinctively different coat stumbling near his mom, both dangling their half of the umbilical cord. Apparently this little guy had just been born and was taking his first steps on this horribly steep, rocky slope. It was quite a thrill for us to watch this newborn as being in the presence of sheep and goats has become a pleasant part in our traveling life. A month ago I couldn’t have told you which millennium the Battle for Crete was in but for a least a few more weeks I could name the day the WWII siege started and stopped. We missed one of the museums dedicated to the battle but have pieced the history together with a few museum exhibits and by visiting the British cemetery at Souda Bay. But today our stop at the German cemetery proved to be the most interesting experience as we were once again touched by the German’s approach to remembering the war. Very little of the extensive display at the cemetery was about the battle (in which they referred to themselves as “the enemy”) but it was instead about peace. The German cemeteries we have visited are consistently and pleasantly reverent and honoring of the men buried at the site. But they are quite successful in making the distinction between honoring the lives lost and not honoring the cause they for which they fought. Most of the narrative material was devoted to their intent to use the cemeteries as yet another means of teaching about peace. We learned that one of the ways they teach the importance of peace is by sponsoring summer youth camps where groups of German youths go to foreign countries to do maintenance work at the German war cemeteries. The youth camps are set-up in conjunction with kids from the guest country so that children from both countries ‘get it’ that wars lead to tremendous loss of life. The other agenda is for the German youths to learn about the hardships that WWII caused on the civilians in the specific locality and to learn first-hand how the scars from the war are still evident in the families they meet. It’s a harsh lesson for kids to learn but it is yet another example of the impressive effort the Germans make to prevent another major war. We couldn’t help but think of the German’s anti-war stance on Iraq while at this memorial. More than one person told us that as soon as the German elections were over last fall that Germany would join Bush’s pro-war camp. Obviously Schroeder didn’t change his position and continued to express the antiwar position of the majority of the German people. It seems like the antiwar philosophy that they had worked so hard to integrate into their society has taken hold even though it required rebelling against ‘daddy’ (the US) for the first time. Despite the German’s hard work to clean-up their reputation they still are much hated by many people in Europe but I worry that the international bullying of our government will demote the German’s to the #2 position on the list of people the Europeans love to hate. I will remember our Cretan visit for the challenging but beautiful riding. In just under a month’s time we rode 570 miles (916 km), accumulated almost 46,000’ (14,000 m) elevation gain, and had mostly cool days in the 50’s F (10-15 C). And then there was the rain. We slogged around on a few of those hills in some good rain storms, but at least we had the rain gear for it. We splashed around in the mud and rain at more than one historical site in our ‘penguin suits’ (gore tex) where the other tourists were shivering in shorts and sandals--this April’s cool wet weather disappointed a lot of sun-seeking vacationers. It was hard riding on Crete but Map Man kept the daily mileage low so we could safely recondition under these fierce climbing conditions. We enjoyed eastern Crete much more than western Crete. We aren’t sure if the differences between the 2 regions are so great or if it was the result of route selection. In the east we were rarely in tourist hot spots along the beaches but spent most of our time up in the hills. Many days we would drop down back to sea level to find lodging for the night but it was often into small villages not yet overwhelmed by tourism. In the west, we ended up spending more time riding through the traffic and commotion of strip-city beach resorts to get to the places we wanted to go. Our travels in the east gave us more exposure to the older people in the country living the hard, but slow-paced life of the past. In the west, the look and feel was more of modern Greeks that were both bored and in a hurry. The locals we encountered in the west weren’t as free with a smile or a word and we felt dismissed and over-charged much more often than we had in the east. I have gotten a bit behind in writing as I have had to suddenly share the laptop with Bill while he was preparing our website—usually I get to hog it all I want. But now that the website is up and running I’ll have time to catch up. I hope to send out our experiences on the Peloponnese peninsula of Greece soon, as it was our next stop after Crete. We have just arrived today in Ancona, Italy after a delightfully uneventful 20-hour ferry ride from Patras, Greece and are ready to begin our travels north in search of cooler weather. Waiting for us was an envelope of biking maps (in German) for several regions in Italy that were sent to us by our friend Alberto that we met 18 months ago. Our first sightseeing destination in Italy is the city of Ravenna, an old Roman capitol, to anchor a bit of slippery history in our minds. We will then ride north into the Italian Dolomites and Alps again this year and hope to rendezvous with friends from Portland somewhere in the region. Our annual Alps crossing will then drop us into either Austria or Slovenia. From there we will ride on to Hungary to see Budapest, one of my few requested sites for the season. Slovakia will be next, followed by Poland and probably Czech Republic. In the fall we will head west towards Spain. Map Man has been carrying a record number of 4 heavy guide books with him since Portland (plus an extra book we picked up in Crete) to aid in his ever-fluid route planning. (We can only count on buying guide books in the biggest cities and nothing large enough was going to be on our route.) Leaving Greece allows him to shed 2 books and a pile of maps, which will definitely lighten his load. Please let us know if you had any difficulty getting to our website or any problems once there. We would especially like to know if you were unable to access the photos, as that is a problem we are hoping the website will solve—some of our readers haven’t been able to open any of the emailed photos. As before, Bill will keep the resolution of the photos low to avoid bogging down your computer. The downside of the low resolution is that the pictures aren’t suitable for printing. And speaking of photos, I made an abrupt shift from only taking a photo now and then to taking about 500 in 1 week as I decided to learn how to photo wildflowers. The digital camera/laptop combination was great as I could look at the results of my efforts on the computer each night. And of course, the digital allows experimenting with abandon as we weren’t paying for developing costs on any of those shots. 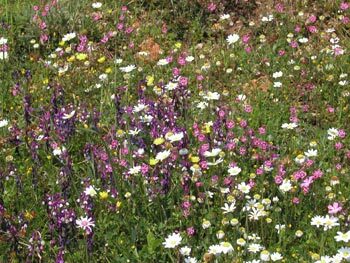 I hope to share the best of my Wildflowers of Greece as a separate file on our website very soon. It was an exciting project as our very forgiving camera took some great shots and the more I looked, the more unusual flowers I found to photograph (though it sure slowed down our riding). But I only spotted a fraction of the 6,000 different wildflowers to be found in Greece and unfortunately I don’t think any of the many orchids. In addition to beginning a repository for more photos, the website will allow us to keep our past emails readily available online. And as we have time, we will add special interest sections about our equipment, what we carry, and some of the problems we have solved that might be of interest to a few people. I am also looking forward to using symbols and formatting enhancements that I have all but forgotten about—like the bolded headings on this email. I have had to keep the formatting very basic to minimize the number of wild substituted characters that show-up at your end of the transmissions. Let us know if you have any suggestions to make our site easier or more pleasant to use—the website is a whole new adventure for Bill and he is learning as he goes. And we are a little technology isolated and feel ‘out of the loop’ so we would appreciate your insights.